MELBOURNE, Australia, January 6, 2014 (ENS) – On Sunday, the Sea Shepherd whale defense fleet located all five vessels of the Japanese whaling fleet, including the Japanese factory ship, the Nisshin Maru, killing whales inside the Southern Ocean Whale Sanctuary. Late Monday, after a 360-mile chase, the Sea Shepherd fleet drove the whalers from the Antarctic Treaty Zone. The captains of Sea Shepherd’s three vessels confirm that the whaling fleet is scattered and currently is not hunting whales. The harpoon ships are separated by hundreds of miles. 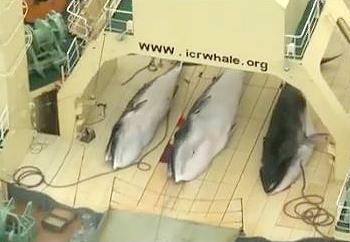 The Nisshin Maru is on the run and unable to stop and kill whales. The three Sea Shepherd ships are still in the Southern Ocean and will continue patrols. Should the Nisshin Maru attempt to return to the whaling grounds, Sea Shepherd will once again try to intercept and shut down their whaling operations. The Steve Irwin’s helicopter first located the Nisshin Maru at 64°44′ S, 162°34′ W, in New Zealand’s sovereign waters in the Ross Dependency Antarctic region, and inside the Southern Ocean Whale Sanctuary. Sea Shepherd Australia obtained video footage and images of three dead minke whales on the deck of the Nisshin Maru, taken at the time the factory ship was first located. A fourth whale, believed to be a minke, was being butchered on the deck. Under the guise of scientific research, the Japanese whaling fleet operates in the sanctuary in contravention of the International Whaling Commission’s 1986 global moratorium on commercial whaling. The Institute of Cetacean Research conducts its Antarctic whale “scientific research program” under a permit issued by the Government of Japan in accordance with Article VIII of the International Convention for the Regulation of Whaling, which allows lethal “research” whaling. The corporation Kyodo Senpaku provides the whaling vessels and crews. The two organizations maintain that their activities are recognized as a treaty right. The Southern Ocean Whale Sanctuary is an area of 50 million square kilometers surrounding the continent of Antarctica where the International Whaling Commission has banned all types of commercial whaling. To date, the IWC has designated two such sanctuaries, the other being the Indian Ocean Whale Sanctuary. But Japan does not recognize the Southern Ocean Whale Sanctuary, established by the International Whaling Commission in 1994 with 23 countries supporting the agreement over Japan’s opposition. 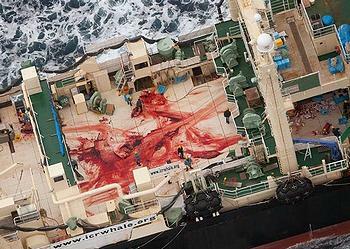 In June 2013, the government of New Zealand joined the Australian government’s challenge to the legality of Japan’s whale hunt in the Southern Ocean Whale Sanctuary at the International Court of Justice. A judgement on the case has not yet been delivered. “The Japanese government’s dishonorable attempt the skirt the legal process is an insult to the cooperation demonstrated by people around the world, dedicated to enacting conservation laws out of a shared recognition for the need for environmental protection,” said Hammarstedt. Managed and led by Sea Shepherd Australia, Operation Relentless is Sea Shepherd’s 10th Antarctic Whale Defence Campaign. In its previous nine campaigns, Sea Shepherd says it saved the lives of over 4,500 whales. Based out of Friday Harbor, Washington in the United States, the Sea Shepherd Conservation Society transferred operational control over its anti-whaling campaigns to Sea Shepherd Australia last year after a U.S. federal appeals court handed down an injunction prohibiting Sea Shepherd USA from approaching within 500 yards of the Japanese whaling vessels. The whale defenders maintain that U.S. courts have no jurisdiction over two Dutch-flagged vessels and an Australian-flagged vessel sailing in international waters. Sea Shepherd Australia remains the only organization committed to defend the integrity of the Southern Ocean Whale Sanctuary by directly intervening against the operations of the Japanese whaling fleet.